Because she wants us to hate her even more, Leida then complains about the child support Eric sends his ex-wife every month. She sees this as money being taken away from HER and HER CHILD, versus the moral obligation of a father to his own children. Hideously, Reina agrees. Thus, it’s proven once again that LEIDA IS THE WORRRRRRRRSSSSSSSST. They deserve to split that one cheesesteak with no fork that Eric foists on them. Later on, they all travel back to the airport to pick up Leida’s parents. 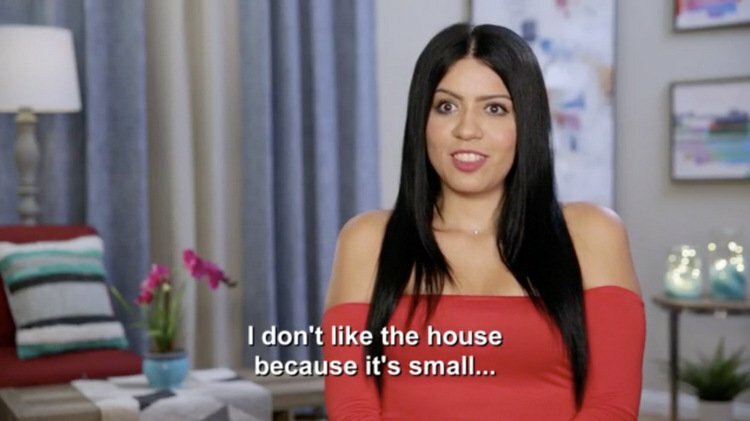 “You gotta impress them!” barks Leida. Eric has no idea how to do this, considering he is a broke, grumpy divorcee who can barely afford his own apartment, let alone things like live-in maids and chauffeurs. 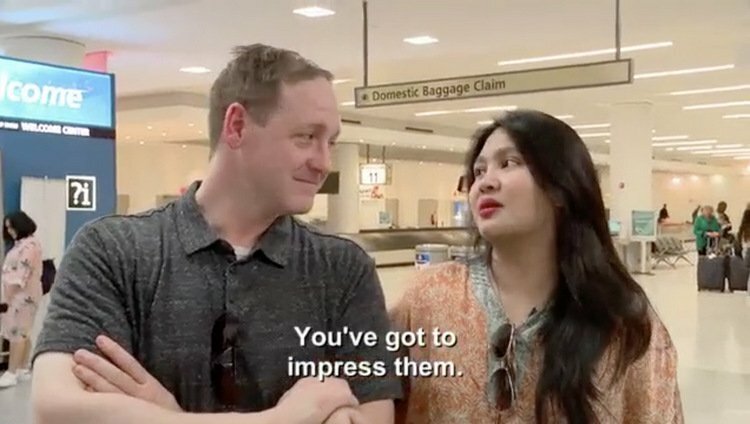 When they arrive, Leida’s parents seem nice enough, but wary of Eric’s ability to “prosper.” Um…ya THINK? Side note: Can we all agree that if Eric is 40 years old, then we are all newborn babes? Because this man is the ROUGHEST 40 I have ever seen. And I live near Baraboo. In Jamaica for their last few days, Ashley and Jay are celebrating the news that Jay’s K1 visa has been approved. 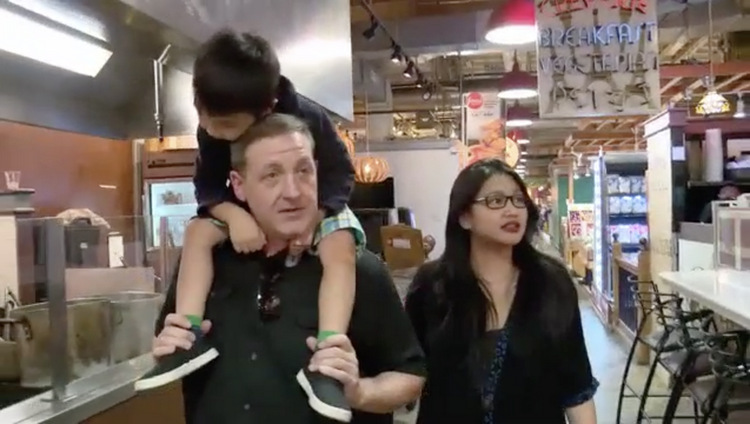 In between being chased with a “heavy sack” thrice daily, Ashley is able to sneak out for some fresh pineapple and a quick goodbye visit with Jay’s family. Jay’s dad, who we are instructed to call “Skinz” due to his Smoove B status, stops by to give Jay some parting advice, slap him some skinz, then peace out. Jay says he’s close with his father and is sad to leave him, but will always remember the lessons he taught him: To give the ladies the D all day, every day. The day of their flight, Jay hugs his family goodbye, especially sad that he’ll be missing the upcoming birth of his niece. 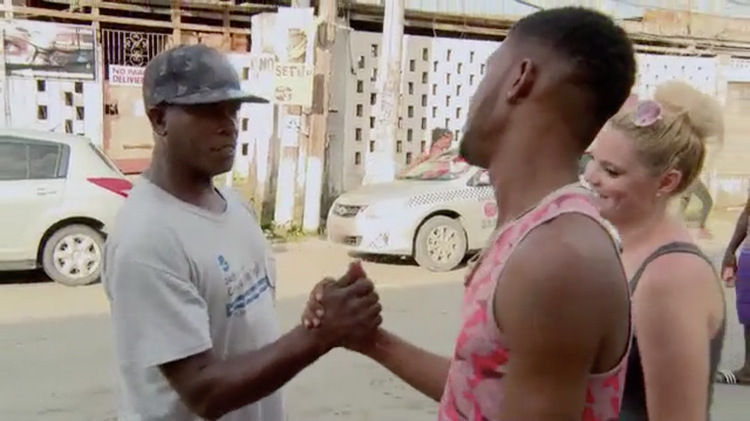 After they land in Baltimore, he’s excited to finally be in the U.S. with Ashley, where he can give her the D in a whole new land. After Steven arrives in Russia (a country he’s successfully googled by this point??? ), he’s thrilled to see Olga at the train station, hugging her and kissing her belly while she cries happy tears. Aww, these two crazy kids! Sure – they’re going to implode in the most catastrophic way ever, but let’s just enjoy the moment. 20-year old Olga tells us she’s overwhelmed with Steven’s arrival, but happy to finally have him with her. Olga also relates to Steven because she’s had a tough upbringing, much like him. In fact, she was raised in an orphanage, so having a family of her own is a huge dream – even if she wasn’t expecting it to happen like this. When they get home, reality starts setting in. Steven and Olga barely know each other, and in just a few days, they’ll be welcoming a son into their lives. Steven only has two weeks after the birth to stay in Russia, but hopes Olga’s K1 visa is approved before he leaves. He also hopes to learn more than three words in Russian, which is the sum total knowledge he brings along. 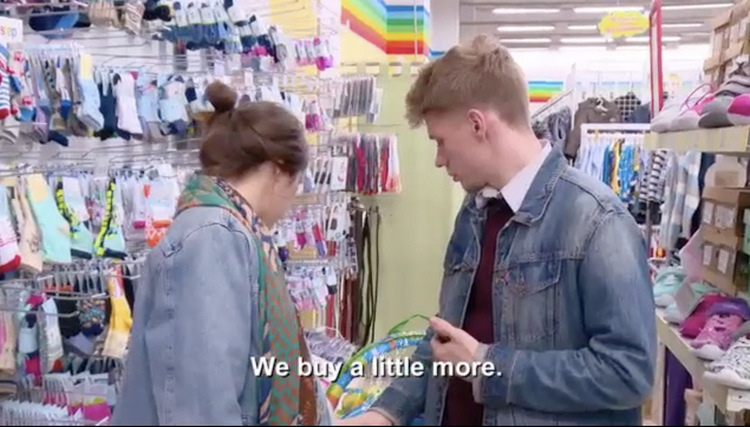 At least he brings along baby supplies, which is very sweet, and promises to take Olga shopping for what they need while he’s there. Although the question is…where are they getting ANY money for this?!? The young lovers are also clueless about how childbirth works in Russia – or it’s just being explained very badly. Apparently, Olga heads into the hospital in two days, then awaits labor? Or something? In any case, men are not allowed in the room during birth, but Steven hopes to apply for a special dispensation. Before this mystery unfolds, they head out to shop for baby gear, which causes their stress levels to rise sky high. Olga doesn’t seem to be concerned about the cost of things, stressing Steven out to the max. “It’s a lot on my plate right now,” complains the kid who decided not to wear a condom. As they ride along in their un-airconditioned vehicle of nightmares, Colt-EEEEE and Larissa literally stew in their own juices. Colt hopes that Larissa’s homecoming will go better in the house than it did in the airport, car, and on the roadside dust heap he took her to already. Colt hopes Larissa is at least impressed with the house. NOPE! 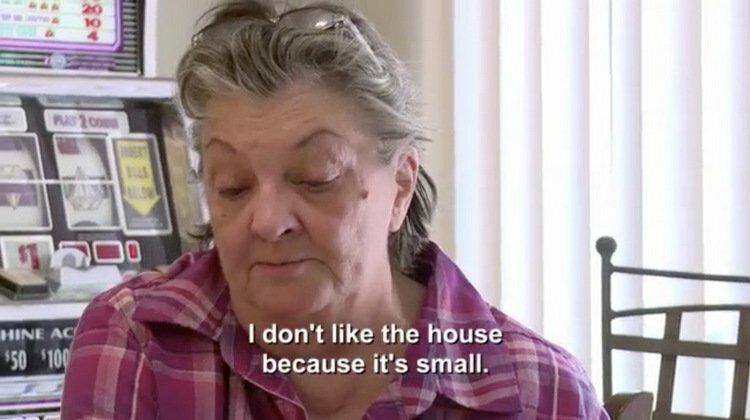 She complains that the house is small, has no furniture in the living room, and is “ugly decoration.” And, let’s keep it real folks…she ain’t wrong. Colt’s mom, who by the way is the ONLY one Colt has shown physical affection to this entire day, breaks down in tears after Larissa lays it on the line. She hates Vegas, she hates the house, and she wants no part of this “beef stew” creation that Mother Colt has cooked in her honor. “I would like to move to other planet, but I can’t do that. So I would like to move to other house,” says Larissa, noting that the slot machine is particularly skeeving her out. When Colt tells her that his father bought the slot machine for his mom, Larissa is mildly embarrassed, but not enough for her to still want it gone. Bottom line: This is going to be an EPIC sh*tshow, guys. Grab your cat costumes and pop your popcorn. “She’s selfish, she’s demanding, she’s not very nice,” concludes Mother Colt. Yup. Sounds about right! Colt just shrugs. The fat shaming continues at breakfast, where Larissa wants to cook a healthy breakfast, unlike the decadent Bobby Flay-reveals that Mother Colt serves up on the daily. After slapping some burnt eggs, dry toast, and whole apples down on the table, Larissa sits back and waits to be praised for her efforts. Colt’s mom is internally like, WTF is this?!? But she graciously eats the slop in front of her, showing Larissa how manners work. She does instruct Larissa about Colt’s care and feeding, which she’s been in charge of for 4 decades. Larissa thinks this creeptastic mother/son arrangement is ridiculous, and it’s making Colt unhealthy. “I want to make some changes around here,” she says, planning to cut the apron strings with a goddamned machete if need be. Down in Bro-Land, Jonathan is already putting Fernanda to work. After cleaning the house, Fernanda is set up on a big girl playdate with Jonathan’s friend, Dani. They head out for some shopping downtown, where they chat about Fernanda’s new life, which mostly consists of hanging around all day while Jonathan works. Dani low-key shades Jonathan’s past, insinuating that Fernanda doesn’t know the “real” man she’s engaged to. When Fernanda tearfully brings up Thong-Gate, Dani just stares at her blank faced. She’s like, YIP, that’s Jonathan! But she also makes excuses for her bestie, saying he probably had “no idea” that thong was in there. Hugging Fernanda, Dani encourages her to leave the past in the past, but empathizing with the fact that Fernanda’s first night in the country was tainted by some other chick’s dirty drawers. Back home, Fernanda tries to clean up the explosive disaster of Jonathan’s living conditions. She doesn’t want to live in a filthy bachelor pad. When she calls her family back home, Fernanda confesses that she’s homesick – especially for her little brother and sister, who she took care of all of her life. Awww! They miss her too, even hoping that Jonathan and her come back to Mexico soon to visit. Sadly, they won’t be doing that – nor will Fernanda’s family be able to come to their wedding without visas. 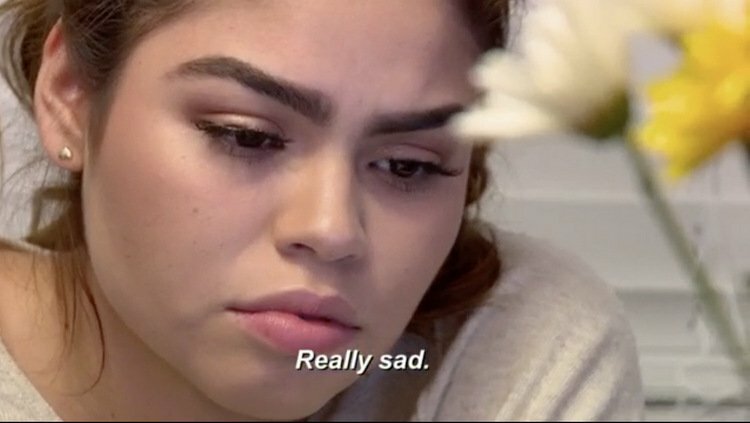 Fernanda and her mom break down in tears, realizing just how final their separation suddenly feels. On their first morning together, Kalani teaches Asuelu how to change baby Oliver’s diaper, something Asuelu admits the men in Samoa never do, but he’s more than willing to learn. 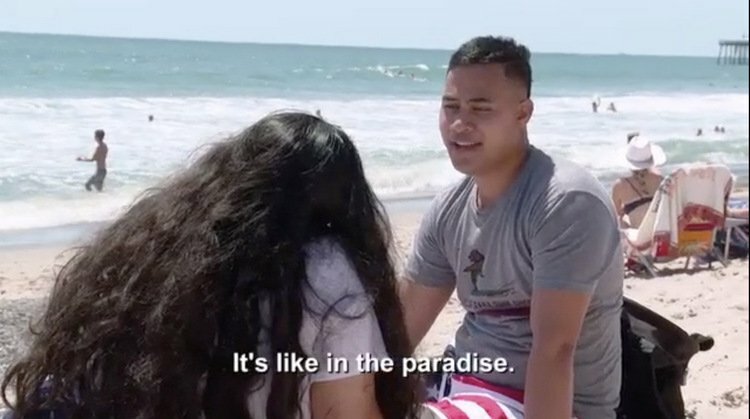 Before the dreaded dinner with Kalani’s father and sister, Kalani takes Asuelu and Oliver to the beach. He’s not particularly impressed with the beaches, nor the lack of coconuts, but his dream of coming to America will not be shattered! “It’s like a paradise,” says Asuelu, who’s nervous for dinner later, but prepared to prove his love and commitment. He even plans on apologizing to Father Kalani for impregnating his daughter before marriage. Um…that should go well! CRINGE. 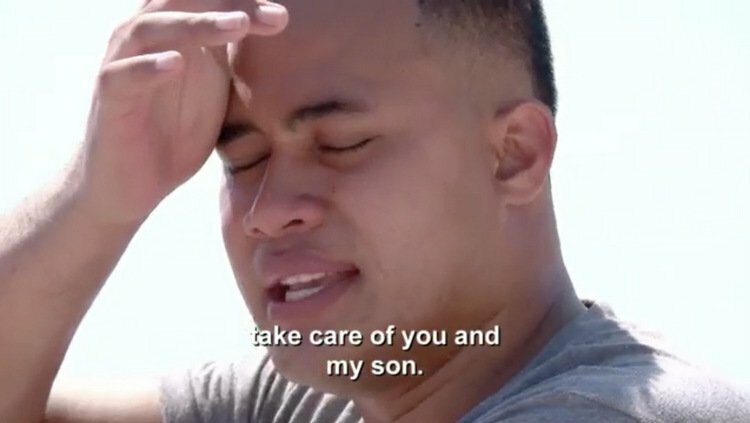 Okay – I have to pause here to honestly say that seeing Asuelu cry about “not being good enough” for Kalani’s family is nearly making ME cry. OMG you guy!! This dude is killing me!!! <sniff> When Asuelu cries, an angel loses it’s freaking wings. At dinner later, Kalani knows what’s at stake, considering it seems like her family financially supports her, thus controlling a good portion of her life. (Real talk though: Does this chick have a job? Is she just an adult child of wealthy parents? What’s going on?!?) 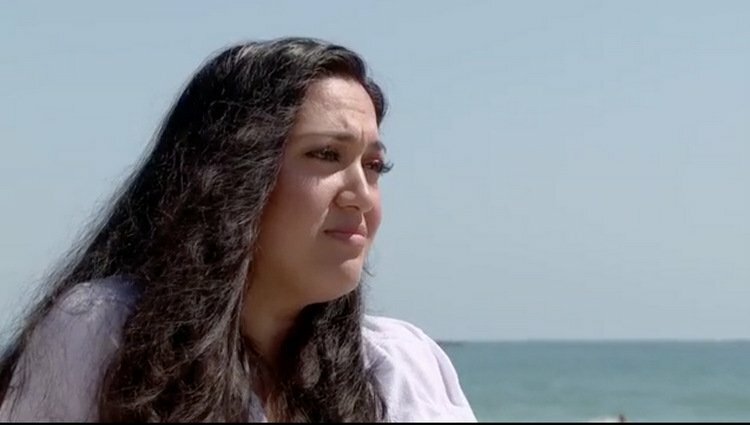 Their concerns seem mostly related to Asuelu’s ability to support Kalani, which he obviously couldn’t do from Samoa – WHERE HE LIVED WITHOUT WALLS. Kalani’s father, Low, and her sister, Kalini, greet Asuelu with perfunctory hugs, then allow an awkward silence to descend over the room. 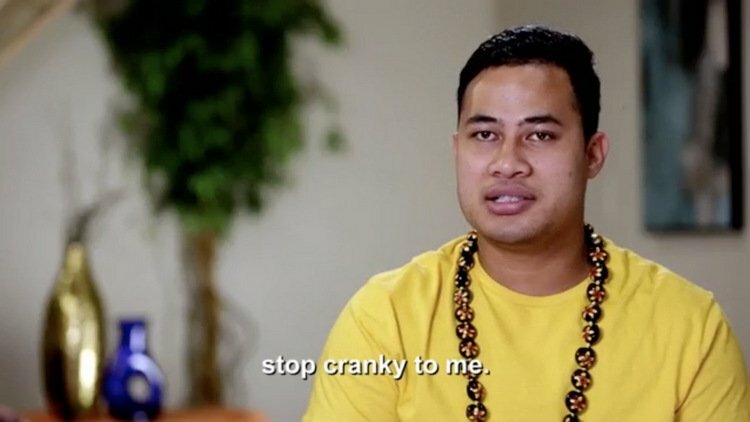 It’s up to Asuelu to actually begin the conversation with an apology for how things started with Kalani. “I will try my best to look after my family,” he says. 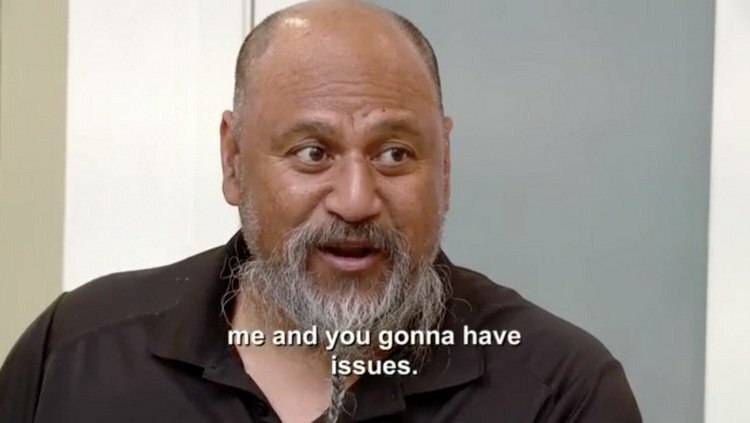 Father Kalani responds with a direct threat: “Rule number one, if you disrespect my daughter, we’re gonna have issues.” Well! There we have it. Asuelu plans to work hard, maybe in construction, to support his family. Father Kalani wants him to know it won’t be easy though, and America isn’t the “land of milk and honey” that some imagine. All Asuelu can offer now is his sincere love for Kalani and Oliver, which Low obviously doesn’t think is enough. Neither does Kalini, who feels like she stood in for the “father” role to Oliver these past months when Asuelu wasn’t around. Kalani hopes her sister and father will come around once they see how loving and committed Asuelu is (or that she hopes he is?). But, as Kalini points out, they’re not ready to accept him because “it’s been like a day.” Well, I guess they’ve got 89 more to go! 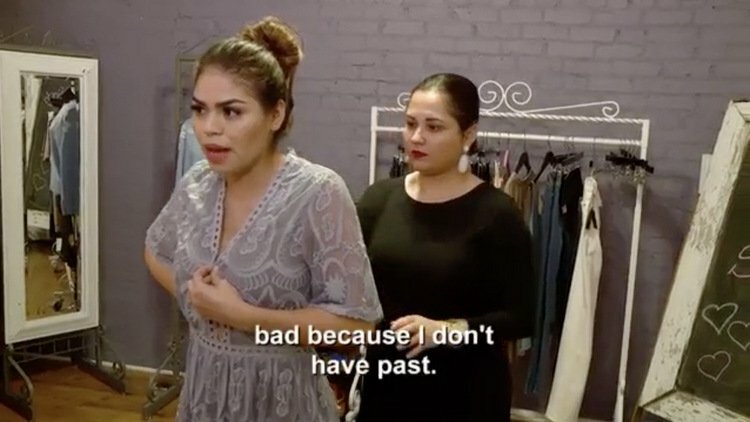 TELL US: IS KALANI’S FAMILY BEING UNREASONABLE OR JUST CAUTIOUS? 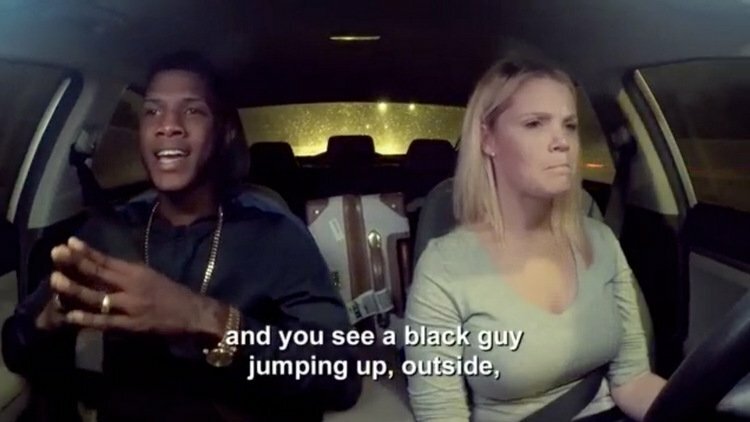 IS LARISSA AWFUL, OR IS COLT TOO MUCH OF A MAMA’S BOY? 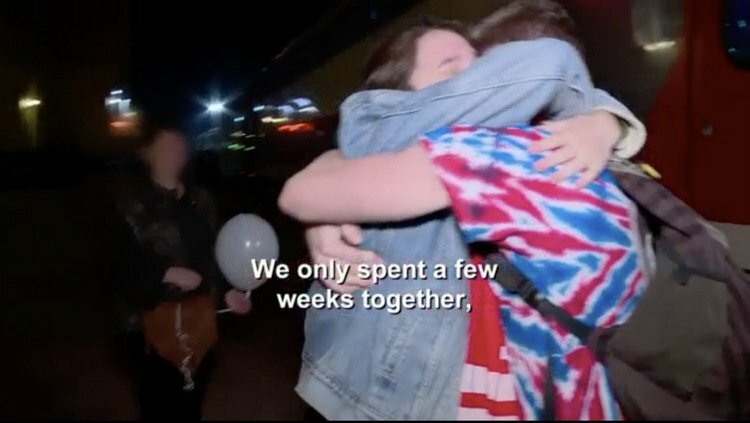 ARE STEVEN & OLGA DOOMED?